Danthonia spicata (L. ) Beauv. ex Roem. Culms: Erect, slender, stiff, unbranched, glabrous. Blades: Numerous leaves in dense basal cluster; erect and ascending; blades filiform, 1 to 6 inches long, .04 to .08 inch wide, sparsely pilose or glabrous, margins often ciliate, involute at maturity, often curling with age. Sheaths: Shorter than internodes, open, glabrous or sparsely pilose, usually with tuft of hairs at throat. Inflorescences: Panicle, erect or ascending, sparsely branched, contracted or open, few-flowered, 1 to 2.5 inches long, .2 to .6 inch wide; branches short, bearing 1 or 2 spikelets. Spikelets: Pedicels ascending, short, stiff; 4-9-flowered, .3 to .5 inch long, disarticulating above glumes and between florets; florets not close approximate; glumes nearly equal, narrowly lanceolate, .3 to .6 inch long, much exceeding lemmas, similar in size and shape, glabrous, tips acute or acuminate; lemmas broadly ovate, .16 to .2 inch, sparingly hairy, tip narrowed to two teeth, teeth acuminate, awn arising between teeth, .2 to .4 inch long, twisted and divergent when mature; palea broad, flat, obtuse. 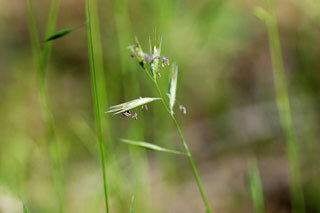 Habitat: Open or dry woods, rocky slopes, upland prairies, roadsides, and dry, disturbed sites; prefers full sun. Forage Value: Low forage palatability for livestock. Comments: Poverty oatgrass forms tufts.